I decided to take a photo of my favourite necklace…one that I normally wear all the time! I bought it in July 2004 while in New Zealand. 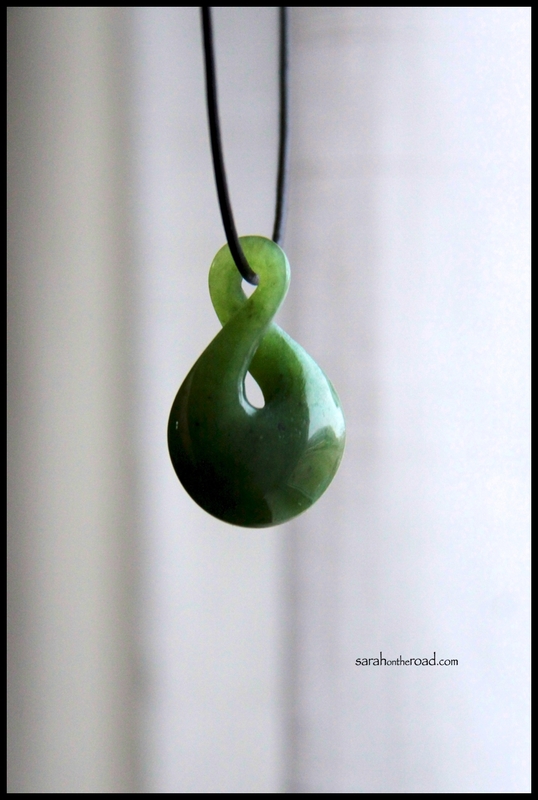 It’s a traditional Maori design made out of New Zealand jade…Maori bone Pikorua. The Pikorua (“single twist”) resembles the path of life and is a symbol of eternity also resembling the friendship, love and connectedness between two persons. I wear one and brought one home for my mum as well. Here’s a shot looking down into my living room from my kitchen! A sneak peak for family and friends of my new house…I just moved in 2 weeks ago. 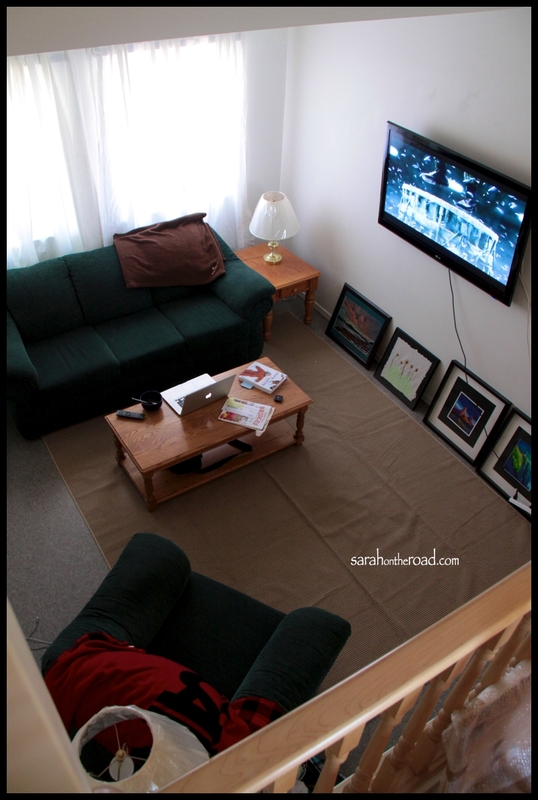 I haven’t decided where to hang my artwork yet… and realized after taking this photo that my area rug isn’t centred in the room! I live in furnished housing…hence the ‘old’ people lamps! Thursday with no internet connection…I decided to sit on my back steps and have lunch! 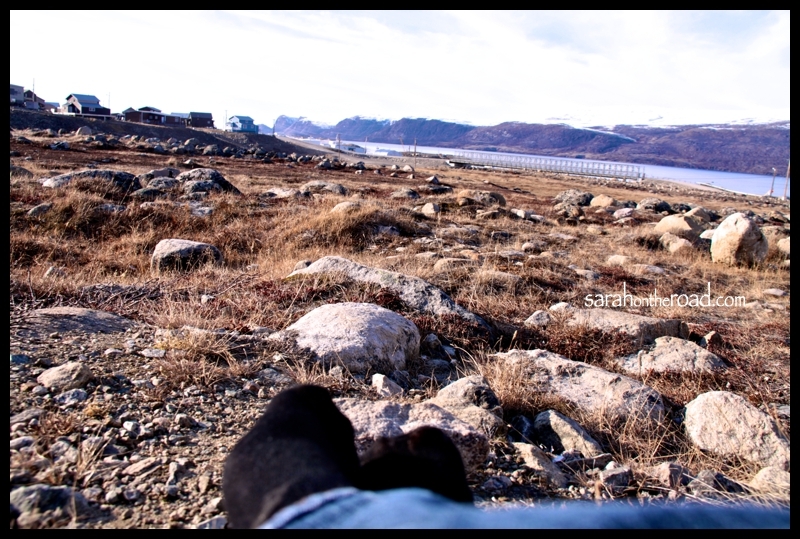 It was a sunny day–but still pretty cold! Here’s the view of my back yard…from the bottom step of my back stairs! 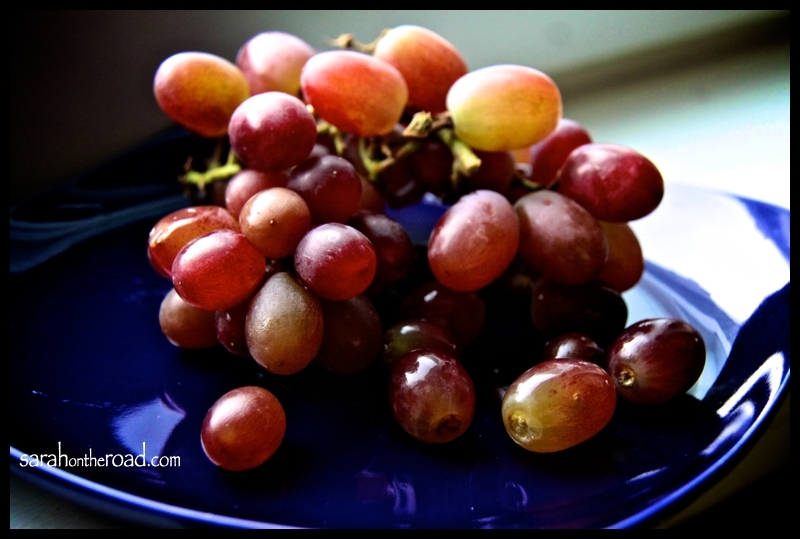 Mmmm Grapes… People are always asking me the ‘prices’ of food while living up here close to the Arctic Circle. To be honest, after awhile you just STOP looking at prices… and buy what you need to buy! When I had strep throat a few weeks ago I finally caved and bought some frozen yogurt…a 2L container for the grand total of $15.75… I remember being crazy shocked when I came up in 2009–blogging about my ‘grocery’ cost for a few items…HERE and again HERE..today it really doesn’t phase me as much… I’m not sure of prices in the ‘south’ anymore… but here in Pangnirtung… these Grapes were 0.250kg…priced at $7.79/kg…for the grand total of $1.95. I have many ‘bad’ habits, but I’ll just share one with you today! 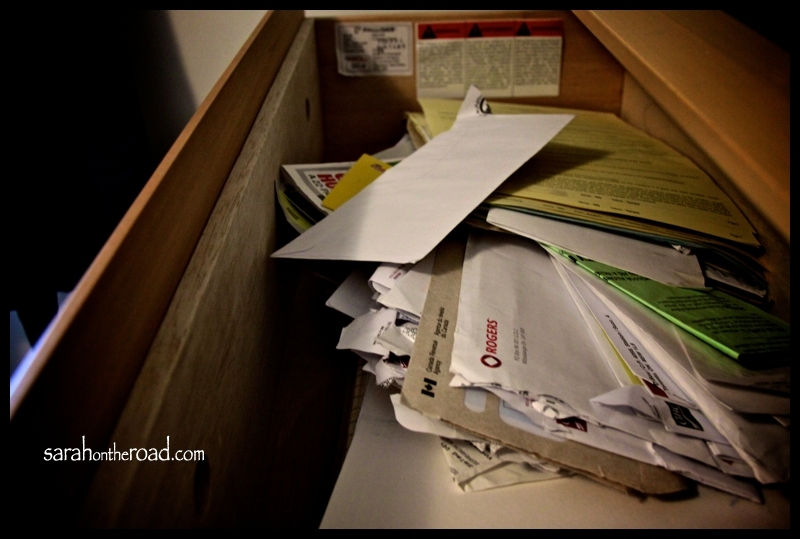 I do have a good filing system, but often my bills, important paperwork and junk mail end up getting stashed ‘in-a-safe-place’ which could be one of many different places…above the fridge, kitchen junk drawer, a reusable shopping bag(a favourite of mine when I lived in Winnipeg-had 3 FULL bags to sort through before moving! ), and pictured below…a dresser drawer in the spare room. I do keep everything, but sometimes finding the right piece of paper might take a bit of time! Don’t worry, I pay the bills before putting them ‘in-a-safe-place’ until they can be properly filed. Perhaps that should be a job this weekend! I’m having great fun with this photography challenge…I think I need to push myself to be even more creative. Which in the coming weeks, might start happening…just because of the lack of daylight (we loose about 6mins of daylight a day..). 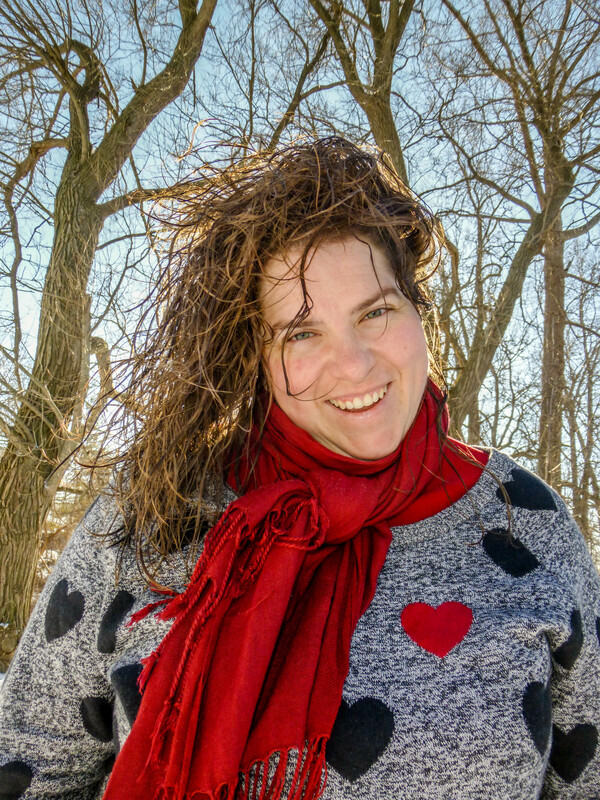 Remember to go take a look at other people’s 30 Day Challenge Photos there is a participant list over at Our Wired Lives there are a lot of really amazing photos being posted! This entry was posted in Photo-a-DAY-Challenge and tagged Photography Challenge October 2011 on October 8, 2011 by Sarah on the Road. I moved to Sweden this summer from California and the food or general groceries pricing was the same, at first I was like you want $25 for razors but now I just get what I need and realize it all works out in the end! This is true… although I have adapted and with the store charging $3/can of pop… I’m OK NOT to drink it!